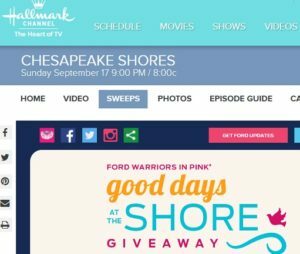 Enter the Hallmark Channel Chesapeake Shores Good days at the Shore Giveaway and you could be one of two lucky winners! 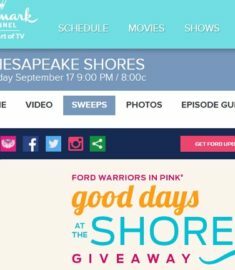 Ford Warriors in Pink is giving twice the good days during this giveaway. A grand-prize winner will drive off in a 2017 Ford Edge Titanium, and a runner-up will enjoy a five-day getaway for four to the Eastern Shore of the U.S. You got to love a great TV sweepstakes like this one! Two winners will be randomly selected to win one of two prizes. A Grand Prize: A 2017 Ford Edge Titanium SYNC 3 responsive technology, Ambient lighting, 19-inch Luster Nickel-painted aluminum wheels! Plus the second prize winners get a trip for four to the Eastern Shore of the U.S. Enjoy this five-day getaway for four to the scenic Eastern Shore of the U.S. which is the inspiration for Hallmark’s Chesapeake Shores setting. I have never visited this part of the country but it looks so beautiful and I could use a vacation! Plus who doesn’t want to win a free car! Where do I sign up? Best of luck to all!